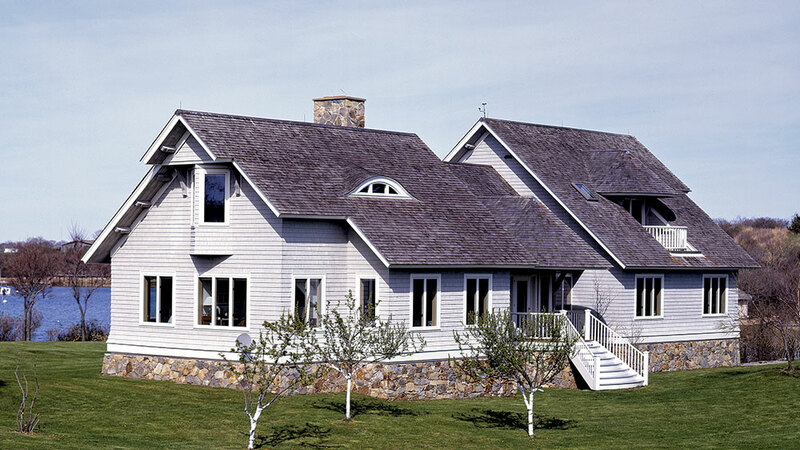 Homeowners, architect and timber provider create a beautiful Rhode Island timber frame home that perfectly suits the historical land upon which it’s built. When architect Jim Fitzgerald, head of Topsfield, Massachusetts-based Fitzgerald Architects, began designing a summer place on Rhode Island’s Block Island for clients, he expected to encounter the typical zoning and permitting issues. Instead, the project was delayed five months for a state-conducted archaeological dig on the one-and-a-half-acre home site. “It was extremely interesting,” Jim recalls. “The site had been an Indian encampment dating back to pre-Columbian times. The state required an extensive survey and dig, and they came up with all kinds of bowls and stuff.” The historical significance of the site gained deep respect from Jim, who sought to disturb the land as little as possible in designing the home. Luckily, the clients agreed with him. Having grown up summering on Block Island—Rhode Island’s version of Martha’s Vineyard or Nantucket—the client’s wife wanted to honor the site and the surrounding homes by leaving the land mostly untouched. She also wanted to build a place that suited the sophisticated but laid-back feel of the area. A timber-frame home was the obvious choice. The resulting showstopper—a 3,800-square-foot, three-bedroom, three-and-a-half-bath home overlooking Great Salt Pond—isn’t just a testament to the spectacular results homeowners can achieve when guided by the right architect. It’s also an example of how seamlessly a project can come together when the architect, clients and timber provider are all in sync. “The design had really been completed by the time Jim brought it to us, but it was fun to see the homeowners realize that the potential for building with timber was much greater than just adding timber elements,” says Ken Bouvier, owner of South County Post & Beam, which supplied the timber for the 18-month project. The core is a true timber frame with a panel enclosure, while other parts are components. Using reclaimed Douglas fir from an old salt barn in Idaho—which proved difficult to obtain—the company re-sawed the 170-year-old timbers for reuse in the home. Although the homeowners chose to soften the timbers with a whitewash finish, the timbers still give the home immeasurable appeal and presence. And staying power, too: The weathered fir is nearly indestructible. The material is as equally suited to its environment as it is to long-lasting construction. Even though the clients came to Jim with a fairly typical wish list—several bedrooms, a striking great room and a guest-worthy kitchen—what they really wanted was a home as meaningful and unique as the land it would rest upon: a place that honored, but didn’t compete with, its sacred setting.